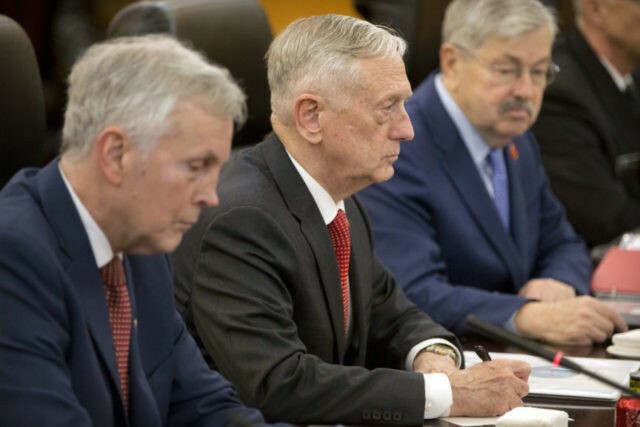 BEIJING (AP) — U.S. Defense Secretary Jim Mattis and his Chinese counterpart struck a positive note as they sat down Wednesday to tackle the thorny issue of how to get North Korea to fulfill a pledge to abandon its nuclear program. President Donald Trump’s announcement of a suspension of major annual military exercises with South Korea fulfilled a long-time Chinese wish. China is the North’s main source of aid, trade and diplomatic support and backs Pyongyang’s call for a “phased and synchronous” approach to denuclearization, as opposed to Washington’s demand for an instant, total and irreversible end to the North’s nuclear programs. The visit also comes amid a brewing trade war between the world’s two largest economies and sharp U.S. criticism over China’s militarization of its island holdings in the South China Sea. The Pentagon disinvited the Chinese navy from a multinational naval exercise the U.S. is hosting this summer in what it called “an initial response” to China’s fortressing of man-made islands in the crucial waterway.